The Council is pleased to announce that the US Department of Energy has officially designated the Land-of-Sky Clean Vehicles Coalition as the 86th Clean Cities Coalition in the nation. Find alternative fueling stations in your area. Click here. Training for first responders to deal with alternative fuel vehicle accidents. BREVARD – Brevard College has teamed up with Tesla Motors to provide an increasingly desirable amenity to the Brevard community: Tesla Destination Charging. The College will unveil one of its two Tesla Electric Vehicle charging stations on Monday, Oct. 26, at 11:30 a.m. at its official ribbon-cutting ceremony. 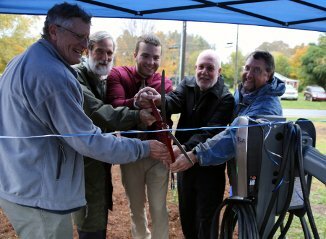 Photo (L-R): BC Geology Professor Jim Reynolds, Bob Harris - Black Bear Solar Institute, SGA President Steve Olson, Brevard resident and EV owner Jim Hardy, and VP of Academic Affairs and Dean of the Faculty Scott Sheffield conduct official ribbon-cutting. Brevard College is now the first College or University in the U.S. to offer Tesla High-Speed High-Power Wall Connector and standard J1772 units for free public-access Electric Vehicle charging and is the first location in Transylvania County to offer EV charging stations. Tesla High Power Wall Connectors add 58 miles of range per hour to Model S, charging the vehicle overnight and replicating the convenience Tesla owners are accustomed to at home. The 2019 Fuel Economy Guide Is Now Available! Ranging from a speed limit of 55 miles per hour (mph) to 85 mph, the maximum speed limit for trucks varies from state to state and sometimes from year to year. Currently, California has the most conservative maximum speed limit for trucks at 55 mph. At the other end of the spectrum, Texas has some roads where the truck speed limit is 85 mph. Because of the varying limits, there is not one common highway speed at which trucks travel. Manufacturers typically design the vehicle to perform well over the entire range of speeds. Past Fuel Facts of the Week. How is fuel economy determined and reported for alternative fuel vehicles? Last month we learned about how the U.S. Environmental Protection Agency (EPA) determines and reports conventional light-duty vehicle fuel economy ratings. While alternative fuel vehicle (AFV) fuel economy testing is largely similar to that of conventional fuels, the EPA makes some adjustments to account for different vehicle technology and fuel energy content. By tailoring AFV fuel economy testing and reporting, the EPA is able to provide apples-to-apples comparisons and allow consumers to make informed decisions.